Indoor bike parking will not be ready for the Barclays Center when it opens in the fall. 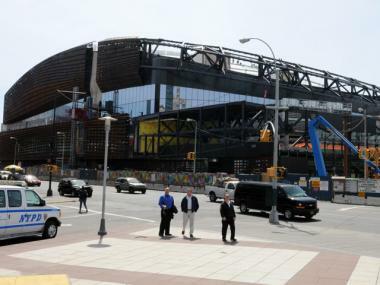 PROSPECT HEIGHTS — The Barclays Center — which expected to have 400 bike parking spots for its grand opening — will not have the indoor space ready for Jay-Z's inaugural concert in September. The parking space for bicyclists will not be ready in time for the superstar rapper's concert on Sept. 28, Streetsblog first reported. A spokesman for the Empire State Development confirmed the report on Monday. An environmental commitment memorandum dated Dec. 21, 2009 and submitted by developers, including Forest City Ratner Companies and Empire State Development, said they would "implement incentives to reduce traffic demand" prior to the opening of the arena, including "free indoor bicycle storage in a secure, manned facility designed to accommodate at least 400 bicycles on the arena block." Bike parking had been planned in the so-called "Building 3," located at Sixth Avenue and Dean Street. Instead, there will be roughly 400 spaces available for riders at bike racks at the Building 3 parcel, according to the development. In addition to there being a lack of bicycle parking, there will also be fewer spots for cars. A plan to use hydraulic lifts to stack cars on top of one another at the arena site, creating more than 1,000 spaces, was abandoned after local residents complained it would create traffic congestion, the New York Post reported earlier this month. Instead there will be about 550 parking spots at a lot next to the arena, the Empire State Development said.